What the Flax? Your 2 minute guide to one of the most powerful plant foods on the planet. Flax, interchangably known as flaxseed or linseed (all the same thing) all come from a plant called…yes, you guessed it, the flax plant. 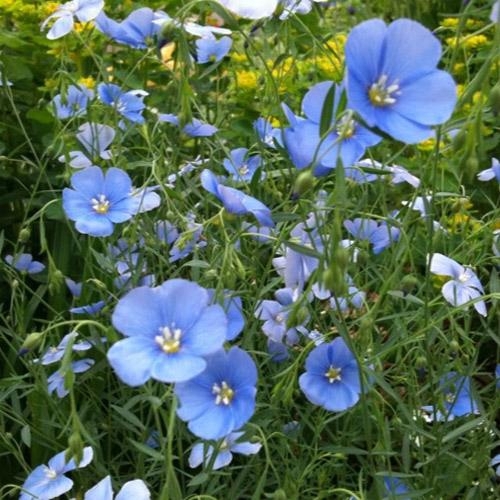 Grown in many countries throughout both the eastern and western worlds, the baby blue flower is believed to have been cultivated by the ancient Egyptians and Chinese as early as 3000BC. Okay, but do we still use it today? The popularity of flaxseed is booming in the UK as the rise in plant-based diets increases in popularity as they are known to be an alternative protein source for people who do not eat meat. What’s more, flax is known to have a number of health benefits linked to reducing the risk of heart disease, cancer, stroke and diabetes. For this reason, it is increasingly found in a lot of health food aisles, either as a seed, flour or oil. Quite a big deal for such a small seed! How does it make me healthier and happier? There are numerous health benefits that have been linked to eating flaxseeds, with varying levels of scientific evidence across benefits including protein, fibre and omega-3 fatty acids, in addition to being a rich source of vitamins and minerals. Flaxseeds have been shown to help limit the development of cancerous cells in the body (1) due to the antiangiogenic properties that they contain which help to stop tumours from forming new blood vessels. This is largely down to the presence of lingans, which are thought to be 800 times higher in the flaxseed than in other plant foods. Flaxseeds are a rich source of alpha-linolenic acid (ALA), a mostly plant-based omega-3 fatty acid, one of the two essential fatty acids that you have to obtain from the food you eat, as your body doesn't produce them. A few studies have found that people with type 2 diabetes who added 10–20 grams of flaxseed powder to their daily diet for at least one month saw reductions of 8–20% in blood sugar levels. Part of the growing popularity of the humble flax seed is down to its use as a great source of plant-based protein, and there's growing interest in flaxseed protein and its health benefits. Flaxseed protein is rich in the amino acids arginine, aspartic acid and glutamic acid. Source of Fibre: Flaxseed contains both the soluble and insoluble types of fibre and just one tablespoon of flaxseeds contains 3 grams of fibre, correlating to 8–12% of the daily recommended intake for men and women, respectively. Sounds great, where can I get it? Ahhh well, forgive us some self-pride here but that’s where we come in! We set our NPD guys a task to find a superfood ingredient that we can put into our protein powders to give you guys an extra healthy boost in a subtle, tasty way. After researching a whole host of seeds, flours and powders then taste-testing them in our sweetener-free protein powders, flaxseed was the clear winner. That’s why we’ve added it to our new chocolate flavour protein powder so that you can live healthier, happier and hungrier for more! Check it out now here!